Hey friends, I hope you all enjoyed our previous contents related to different topics. Now I would like to introduced an amazing topic related to bluehost and hostgator. Our previous article Make Money With Hostgator Affiliate Program is related to how you can make and earn money with hosgator web hosting company. When we compare two things, we saw so many differences between them, and we can easily understood its benefits and drawbacks. 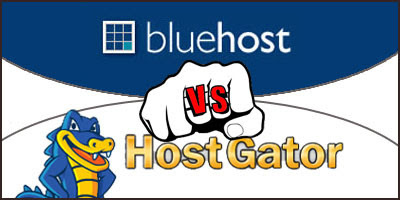 That time we compare the two important web hosting companies like Bluehost and Hostgator. As we all know that there are so many web hosting companies are available on web. Bluehost permits and offer one product/item, that is shared within Linux hosting. From this, we can see that they target at individuals, web developers and small business. Hostgator only offer relatively complete product line, that is includes shared hosting, VPS (Virtual Private Server) hosting, and dedicated server on both Linux and Windows platforms.